Alex Iles | McGinty Music, LLC. Trombonist Alex has enjoyed a varied and successful career in many musical settings. He is an active member of the musically diverse Southern California freelance performing and recording community. Alex began his musical career while a student at UCLA, as a member of the Disneyland All American College Band. He has studied trombone privately with Roy Main, Ralph Sauer, Byron Peebles and Per Brevig. Since graduating from UCLA, he has gone on to enjoy his musical life as an in-demand trombonist/lowbrass performer. Among the varied palette of artists with whom Alex has performed and/or recorded are: Joe Cocker, James Horner, Esa-Pekka Salonen, Alan Jackson, Zubin Mehta, The Tonight Show, Seal, Hans Zimmer, Johnny Mathis, Lalo Shiffrin, Natalie Cole, Danny Elfman, Ray Charles, Trevor Rabin, Harry Connick Jr., Robbie Williams,Henry Mancini, Josh Grobin, John Zorn, Terence Blanchard, John Williams, Fallout Boy, Johnny Mandel and Prince. He has toured as lead and solo jazz trombonist with Woody Herman and Maynard Ferguson. Today, he performs and records as a regular member of many of the top big bands and jazz groups in the L.A. area including Bob Florence’s Limited Edition, Gordon Goodwin’s Big Phat Band, and The Tom Kubis Big Band. He has performed on hundreds of motion picture and television soundtracks. Alex has played in the pit orchestras of numerous Los Angeles productions of Broadway shows including: “The Lion King”,”Phantom of the Opera”, “Chicago”, “West Side Story”, “The Producers” and “Wicked”. In 2002 Alex was appointed principal trombonist of the Long Beach Symphony Orchestra. He has also performed as alto, tenor and bass trombonist with the Los Angeles Philharmonic, The LA Chamber Orchestra, The Hollywood Bowl Orchestra, The Pasadena Symphony, The Pacific Symphony, and the Santa Barbara Symphony. He has also composed, commissioned and premiered several new works for solo trombone. Alex has been a faculty trombone and jazz instructor at the California Institute of the Arts . Azusa Packific College and California State University, Northridge. 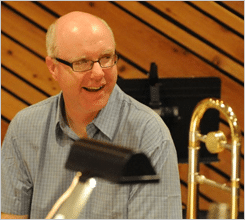 He has appeared as a recitalist, guest soloist, and clinician at the with schools and organizations throughout the United States, including Indiana University, Oklahoma State University, The University of Southern California, and the International Trombone Festival. He is also a consultant and clinician with the the Disney Magic Music Days Program and Disney All-Amercican College Band Program. Alex is a Conn/Selmer performing artist and plays King and Conn trombones.